Petique Unveils their Modern Black and Green Camo Strollers for your Pet’s Luxury Experience! In line with the company’s goal to enhance your pet’s lifestyle, Petique Inc. is adding their newest versatile product to their travel collection, the Black Camo and Green Camo Pet Strollers. These modern outdoor strollers are designed for your pets to experience the coolest and finest ride. Not only are they great for the summertime, they’re also perfect for the coming fall and winter months , making it easier to take your precious fur friends with you, any time of the year. Whether you love to go out for a picnic, camping or walking, the multi-purpose stroller is excellent for you and your pet and any adventure you may wish to go on. The strollers have durable and large EVA tires and the double front wheels are complete with swivels and locks for easy reversing. The wheels are also strong enough to conquer rough terrain or smooth sidewalks, making it perfect for any type of outing. What’s more, they have a large basket below for any items you want to carry along, while the back pockets are great for extra essentials such as water, your phone, or snacks. 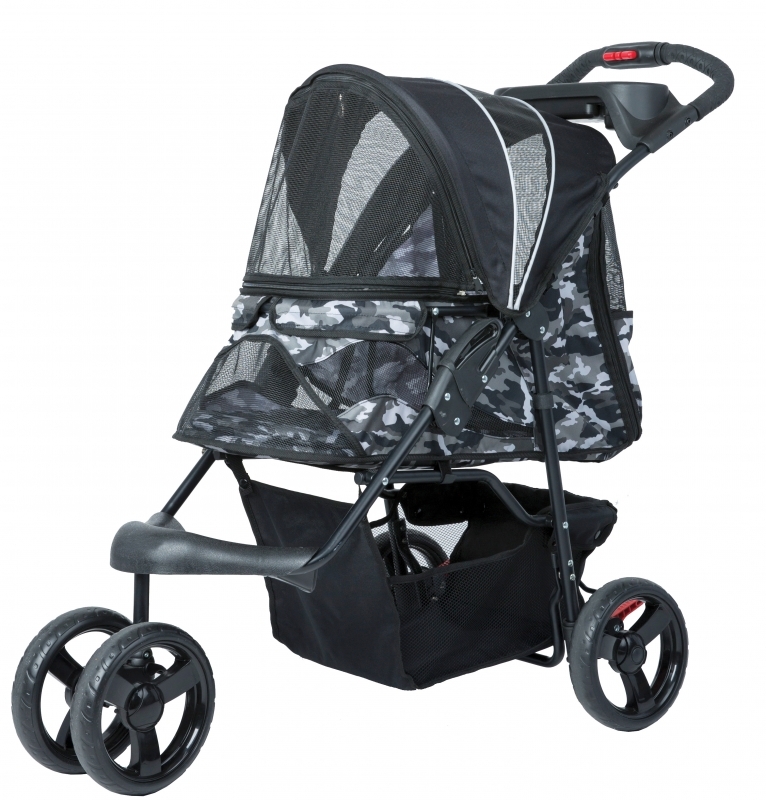 These military-inspired print strollers will make your pets feel heroic and with ventilated mesh windows throughout, your pets will feel the cool breeze and instant relaxation. You can even remove and wash the fabrics, making any clean up needed easy! The strollers also boast the benefit of being easy to fold with their one hand folding mechanism that lets you fold while standing. Petique’s Green and Black Camo Strollers make amazing gifts for your pets to experience luxury and protection in all seasons. Allowing you to go out in the hot weather during summer without injuring your pet’s paw pads, whilst in the winter, your pet can avoid the freezing cold outside. Just strap your pet inside the ride, and you’re ready to experience the wonderful outdoors. One stroller can carry pets up to 30 lbs (15kg), suitable for your medium-sized fur buddy. Since 2017, Petique, Inc. has envisioned giving your pets the ultimate care, comfort, and fun. As the company takes responsibility for your pets, it also takes its part in saving the planet through their eco-friendly products!